The Captain America movie is on its way to theatres soon, and so the Captain America toys have made their way to store shelves. The line is about 90% Cap, plus a few shortpacked villains nobody can find, which is why our first review is an exclusive three-pack. These are legendary men - men forged from the toughest stuff this world has to offer. They are heroes to their people and the world. And though they may be distinct in personality and approach, they are each bound together by a universal quest for justice. 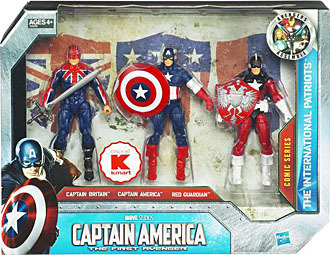 It should come as no surprise that this set includes a Captain America - he's the star of the show, of course, so it would actually be weirder if he weren't included. But since this is a comic-styled release, don't look for a Chris Evans likeness or anything; like the Iron Man 2 line, the Captain America figures are divided into movie and comic subsets. 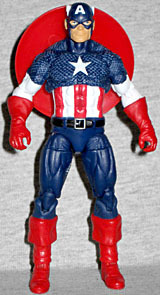 The Cap in this set is the same basic "comicbook" body many of the other figures have. It's not the same body used for the Marvel Universe Captains America - it's a bulkier sculpt, with different proportions and articulation. The armor on his chest and shoulders is all sculpted, as are the stripes on his abdomen and the stars in the center of his chest and his back. He's wearing a simple black belt with a silver buckle. The bulk of the figure is molded in a very dark blue plastic, which looks great on the uniform, but does present a problem for the head. It's a good sculpt, but they have to cake so much paint onto it to keep the blue from showing through, details begin to get lost. The white used for the wings and forehead A are fine, it's just the skin that seems thick. Articulation is fine - mostly. The figure has a balljointed head, swivel/hinge shoulders, swivel/hinge elbows, a balljointed torso, swivel/hinge hips, swivel thighs, double-hinged knees and swivel/hinge hips. That's all very nice, but can anyone explain why he doesn't have wrists? This is 2011, not 1998; wrists are to be expected. It doesn't have to be a joint at the wrist, it just needs to be a swivel somewhere in the forearm so you can turn the hand. 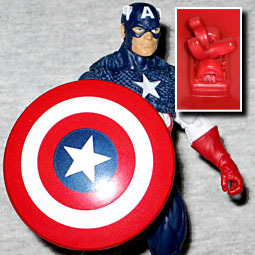 In Captain America's case, the top of his gloves would work perfectly, so why is he solid from the elbow down? Cap's got one accessory, his shield. It's 1¾" in diameter, and the details are painted on, not sculpted. 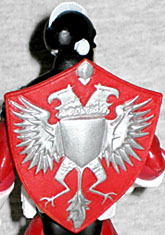 There are no straps to hold the shield on the figure, just a clip for the wrist and a peg for the hole in the back. Technically, they're the same thing: one clip/peg combo device that's hinged so you can switch between the two. It's an interesting solution to the problem. 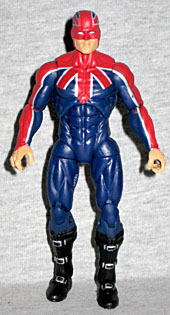 Next we have Captain Britain, Brian Braddock, the mystically empowered defender of the British Isles. He's already had a Marvel Universe figure, and there's another in Series 2 of the Captain America toys, which means he's had three figures in less than the span of a year. That's pretty darn impressive! Brian is the tallest figure in this set, which is rather unexpected - yes, he's listed as 6'6" in official Marvel sources, but who ever actually pays attention to those things? He gets a unique sculpt, not shared with anyone else: it's a very superheroic physique, muscular in a way no normal human could ever be. There's fine detailing in the sculpt, such as the small wrinkles that fall over his muscles, or the edges of his sleeves sculpted on his hands. Other than that, the only 3D costume elements are his boots. This particular costume, with the red and white stripes layed over the shoulders of a dark blue bodysuit, is the one that appeared in Captain Britain and MI-13, a book which not enough people read, and didn't last nearly as long as it should have. The figure is wearing a mask, oddly: this uniform didn't have one in the books, leaving his head uncovered. 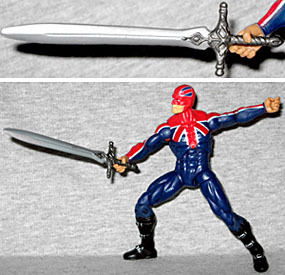 Captain Britain has the same articulation as Captain America, but he also gets wrists. Hooray! This allows you to get him into lots of fun poses and have him accurately wield his one accessory: the fabled blade Excalibur. The sword is 2⅞" long, and painted nicely in silver and grey. The hilt can be gripped well in either hand, so all we're really missing is a stone to store it in when Captain Britain's not carrying it around. And finally, after Captain America and Captain Britain, we have Captain Russia. Sorry, "Red Guardian." Way to break the pattern, Comrade. He basically is "Captain Russia," though: he was the Soviet Union's answer to Captain America, though obviously never as successful as Steve Rogers was. The original Red Guardian was Alexi Shostakov, who was married to the Black Widow before she became a spy. But he (seemingly) died while on his first mission, so there has been an utter parade of people using the name since. I think they're on their seventh or eighth Red Guardian now. This figure's costume is as current as they come. It was introduced in 2010's Darkstar and the Winter Guard, where it was worn by the newest man to use the codename, Nicolai Krylenko. Nicolai is a mutant, proving that it was easy for mutants to retain their powers after House of M if no one remembered that's where their powers came from (cf. Cloak and Dagger). Red Guardian's sculpt is all-new, which is nice to see - since he wears the same kind of boots and gloves as Cap, they could have reused those pieces. Even his utility belt is new! He's a little skinnier than Cap, and is distinguished by the fin on his head. You need to watch out for his paint - make sure the white stars on his chest and shoulders are crisp before you buy. Nicolai was formerly known as Vanguard. Back then he had a hammer and sickle that allowed him to amplify his mutant powers (he can repel any force which is directed at him - so basically a personal force field), but as Red Guardian his only accessory is a vibranium shield. It's another clue as to which version the character is, because Nicolai is the only one who's used this particular design, which is based on the Russian Federation's coat of arms. In the comic the background was black, not red. 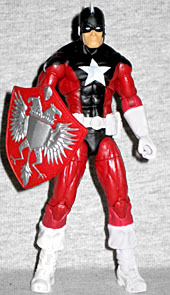 Like Captain America, Red Guardian's shield has the clip/peg combo, and also like Captain America, the figure has no wrists. The International Patriots box set is a Kmart exclusive, and retails for $20. That's right on par with buying individual figures, so you're not getting ripped off. The Captain America figure is a perfectly vanilla representation of the character, Captain Britain hasn't been done in this costume yet, and there's never been any kind of Red Guardian before. Clearly the kind of character diversity that's made the Marvel Universe line so popular has carried over to Captain America.